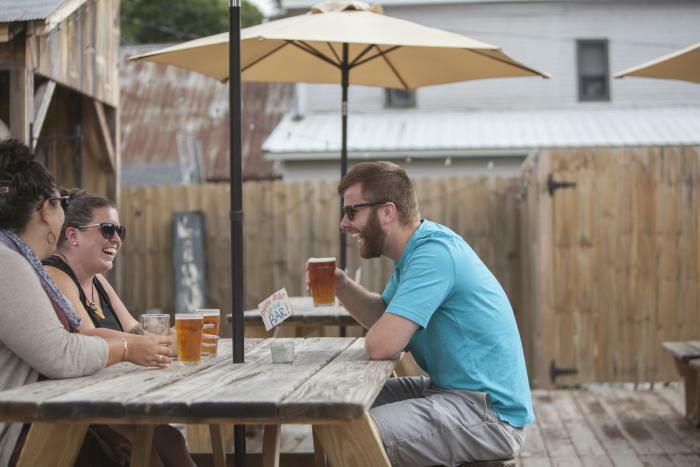 It&apos;s Summer -- Take Your Beer Outside! Wine is wonderful in its place, and so is whiskey. From time to time I have even been known to drink a glass of water, despite what W.C. Fields said about it. But on a hot summer day, it is beer and beer alone that satisfies. So it is a good idea to visit the Traverse City area, where there is a great deal of fine beer to choose from. Not those heavy stouts and porters, mind you. And frankly, none of those so-bitter-your-eyes-pop-out IPAs, either. 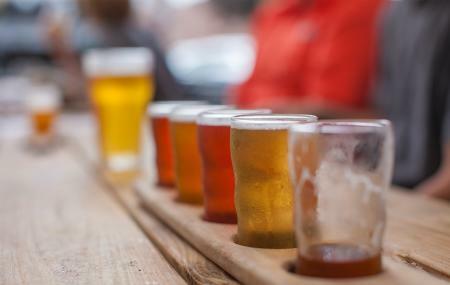 When it’s hot out, you want something light and refreshing: a nice wheat beer, a saison, a gose, a kolsch, a weisse or Belgian, or even a flavorful pilsner. But that’s only half the story. For many of us, the enjoyment of a malt beverage can be influenced for good or ill by the atmosphere of the place that’s serving it. And in the summertime, I like to do my drinking outdoors. Fortunately, most of our local brewpubs have outdoor seating of some kind. And there’s a big range of settings. If you’re already in town, for instance, and you don’t mind sitting at the edge of the street, you can do the sidewalk thing at the North Peak Brewing Company or the Workshop Brewing Company. 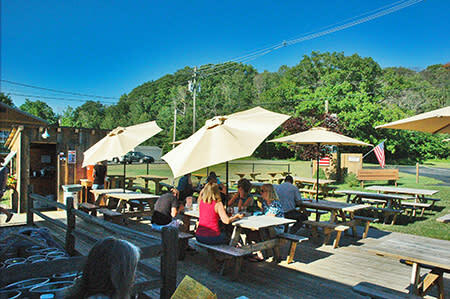 Or head a little south of Downtown Traverse City to the SoFo neighborhood, home to Right Brain Brewery. 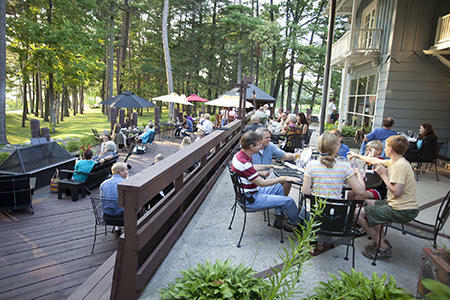 Sit on the patio and take in the scenery around the Boardman Lake. 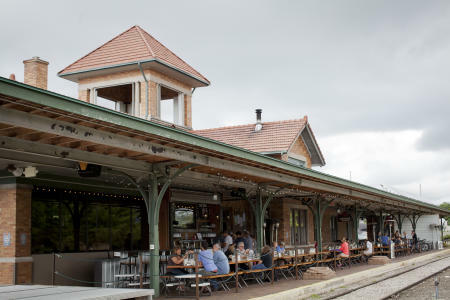 Or you could enjoy some “ales by the rails” at The Filling Station, which occupies the former Pere Marquette Railroad depot at the north end of Boardman Lake. Here you can enjoy your beers and food at tables along the tracks, with a nice view of the lake thrown in for free. The very pinnacle of the Traverse City area biergartenheit stands just outside the village of Suttons Bay, at the Hop Lot Brewing Co. which actually looks like what you’d get if Munich’s Hofbrauhaus had been designed by Red Green. Hop Lot’s taproom involves a lot of natural wood and reclaimed barn lumber, but the real draw is their sprawling outdoor beer garden: nearly an acre of picnic tables and outdoor games in the woods behind the brewhouse, with a stage for musicians and several comfy fire pits for those cool nights under the stars. A different take on rural brewing can be found at Brewery Terra Firma, the area’s first “farm to mug” brewery, on a century-old farm south of Traverse City that grows most of its own ingredients. There’s no old barnwood in their taproom; it’s a bright airy space, built from scratch, but there’s also a really nice patio out back where you can sip your beer in a bit of pastoral quiet and watch the wind blowing through the tall grass meadows. A more elegant place to enjoy a beer al fresco is on the deck at the Mission Table/Jolly Pumpkin at Bowers Harbor on the Old Mission Peninsula. It’s hard to argue with the sublime restfulness of this broad veranda, where one may quaff beers and ales by Jolly Pumpkin, North Peak and Old Mission Beer Co. as the shimmering light of afternoon on Bowers Harbor filters through a grove of elegant old-growth pines. Summer. Beer. The outdoors. It’s why we’re #hoppyinTC!